Thousands of people fleeing fear of violence in Burundi arrive in Mahama Refugee Camp, Rwanda (file photo). Burundi has shut down the United Nations human rights office in the African country, UN human rights chief Michelle Bachelet said in a statement on Tuesday. "It is with deep regret that we have had to close our office in Burundi after a 23-year presence in the country," Bachelet said. "Since the UN Human Rights Office in Burundi was established in 1995, for many years we worked with the government on peacebuilding, security sector reform, justice sector reform and helped build institutional and civil society capacity on a whole host of human rights issues." "Unfortunately, many of these human rights gains have been seriously jeopardized since 2015," Bachelet said. Burundi has been in a political crisis since April 2015, when President Pierre Nkurunziza sought a third term in office. 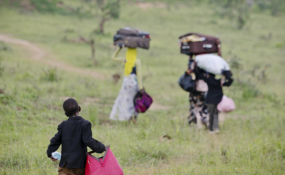 At least 1,200 people have been killed and more than 400,000 others displaced due to violence, according to the International Criminal Court (ICC), which has opened an investigation. The ICC investigation prompted Burundi in 2017 to become the first country to withdraw from the body established to prosecute the world's worst atrocities. In 2016, Burundi suspended all cooperation with the UN human rights office following the release of a critical report. In December 2018, the Burundi's government requested UN human rights office close, explaining the human rights improvements made the international presence unnecessary. The demand to close the office came after former UN human rights chief Zeid Ra'ad al-Hussein last year accused Burundi of being "some of the most prolific slaughterhouses of humans in recent times." The UN human rights office in Burundi was established 1995 at a time of massive human rights violations carried out in the country following the assassination of then President Melchior Ndadaye. Every evening at 1830 UTC, DW's editors send out a selection of the day's hard news and quality feature journalism.